It’s becoming more and more obvious that Aeroplan is becoming relatively worthless (depending on how you redeem) but for now, they’re the primary non-flying method to obtain Star Alliance awards. For those who are still willing to put in effort, I’ve noticed that there is a possible opportunity to earn 50 points per dollar spent on the Aeroplan eStore. 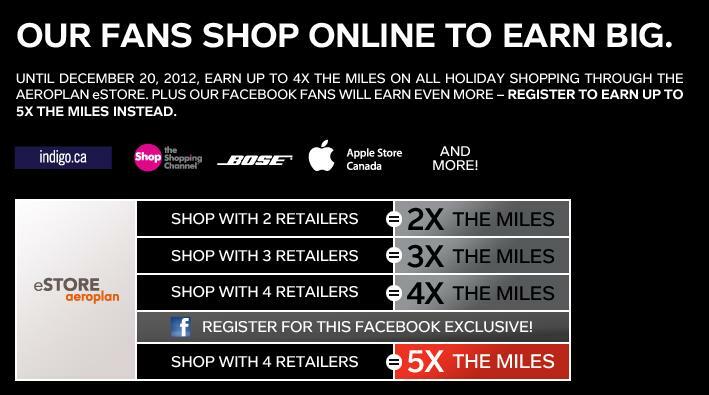 When registering on Facebook, shoppers have the opportunity to earn 5x the miles spent when shopping with 4 retailers. That means, you earn could earn ” up to 5X the miles on purchases of $25 or more made online through eStore between November 14 and December 20, 2012.” That means if these promotions are stackable on top of the regular offers on the Aeroplan eStore, you could a lot of miles per dollar spent. That’s a potential 56,250 miles on a $2,000 purchase. That’s crazy! Aeroplan Members who are also Aeroplan Facebook fans will earn up to 5X the miles instead of up to 4X the miles on purchases of $25 or more made online through eStore between November 14 and December 20, 2012 only if they have registered online before shopping. Bonus miles will be credited to the member’s account at least 42 days after the end of the promotion. Gap, Old Navy and Banana Republic are considered as a single retailer for the purposes of this Aeroplan eStore promotion. This offer applies on purchases of 25$ or more. Bonus miles are awarded on the base miles earned for every 1$ spent. 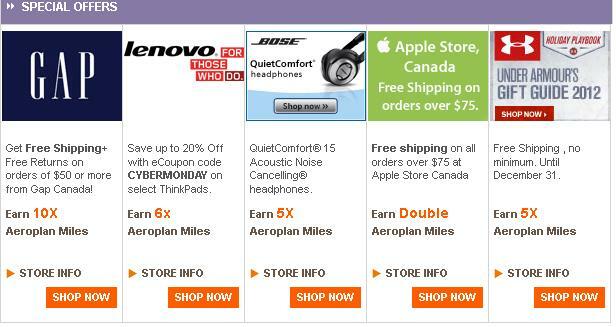 Earn 10 Aeroplan Miles for every CAD $1 you spend! Sale amount does not include taxes or shipping and handling fees. Please allow 6-8 weeks for miles crediting. 10 Aeroplan Miles per 1$ means it’s base spend, right? There’s no mention as the miles per dollar being “bonus” spend. Again, for these types of posts, it’s definitely YMMV. I don’t guarantee the accuracy of these things, so I don’t recommend making purchases on a whim. Just like the Hawaiian Transfer Controversy, I may be incorrect. I don’t know exactly what goes inside the corporation so form now on I’m going to definitely try and be a little more clear with how this works. And Aeroplan miles are not as useful as they could be, but for Christmas Shopping that I would have considered, there’s nothing to lose. You get points for credit card spend anyways. Are you going to do anything with this? I’ve already done some similar shopping through the airmilesshops.ca website (where there is currently a 20x deal). Your math could be right, but I agree that it’s ambigious (which I am sure is on purpose!). Half the time, these points never even get credited, let alone credited properly (8-10 weeks to see them sometimes). I have some stuff to buy at the Gap and a couple of other places, so I may try just for sh!+s and giggles and see what I end up with!